I may not have been completely sold with midi skirts when they first hit stores last fall, but now I’m convinced. I can’t stop buying them, and luckily designers keep putting them out into the fashion universe! It’s a universally flattering silhouette as it aims to cinch the smallest part of your frame (your waist), while hiding your hips and booty. I always like to show off a little leg and a midi skirt does that well too. It doesn’t show much, just enough – don’t you agree? I wore this look to my friend Kelly’s wedding at the beginning of this month and got so many compliments (see the insta). While my fave Lela Rose skirt is sold out since it’s from spring, this skirt is a fabulous alternative. Same length, similar print and a soft color scheme – all the makings of a beautiful cocktail or evening ensemble for spring or summer! As far as Lela Rose goes, you just can’t lose. Whether you’re on the hunt for the essential LBD, a scene-stealing cocktail dress or a versatile, reversible number for fall, you’re going to look fabulous. If the tasteful Duchess Kate wears Lela, (specifically this sheath), you should too. Always love that skirt, such a pretty and ladylike look. Gorgeous skirt! I love your hair like this, and those sandals are perfect! Yay! The pictures turned out so awesome! You look beautiful! 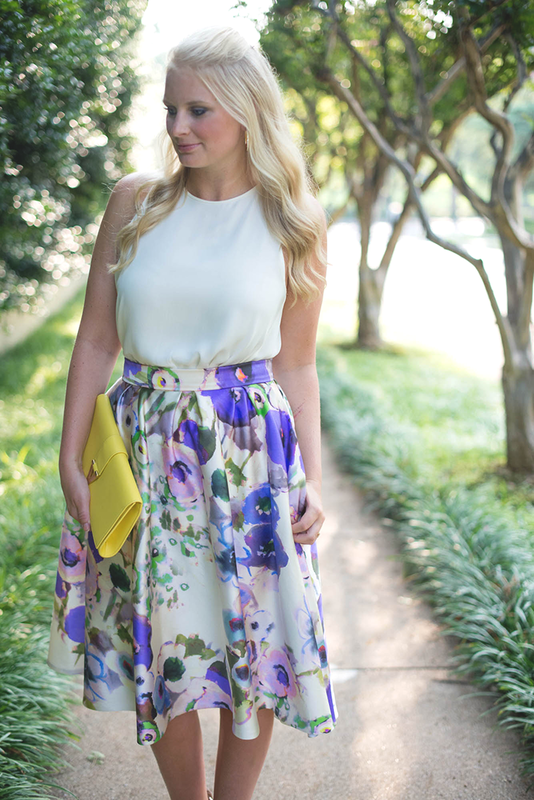 Her prints are beyond beautiful, I adore the watercolor print on this skirt. So pretty Merritt! This is a lovely outfit. 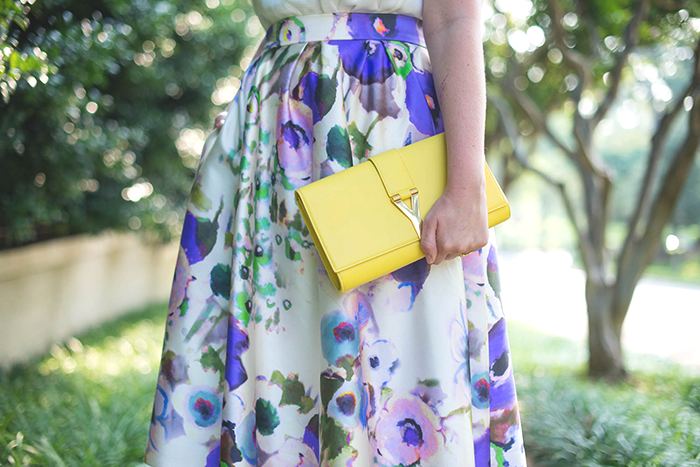 The skirt and bag are perfect together. Happy Friday! Yay! I’m so happy that this skirt made another appearance on here! It’s beautiful! This skirt is GORGEOUS! Love love love this look! 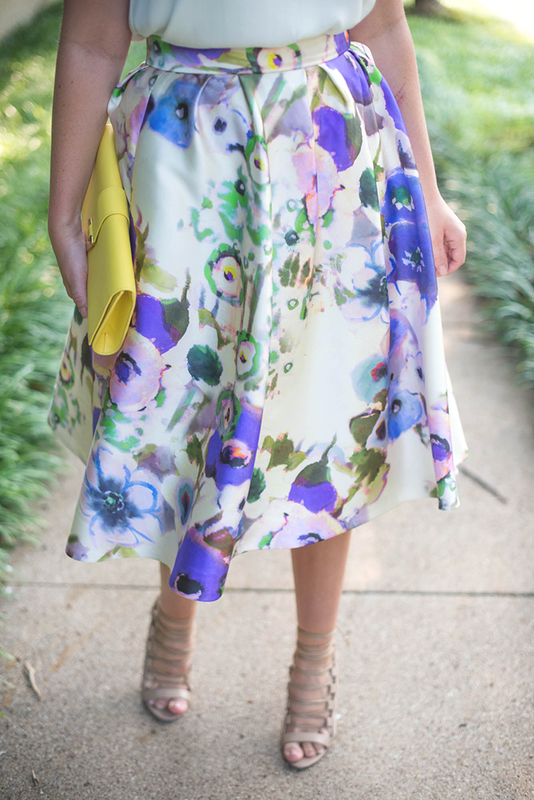 Beautiful floral skirt. Very pretty and feminine. I remember putting this skirt on my blog a while ago because I was so infatuated with it! 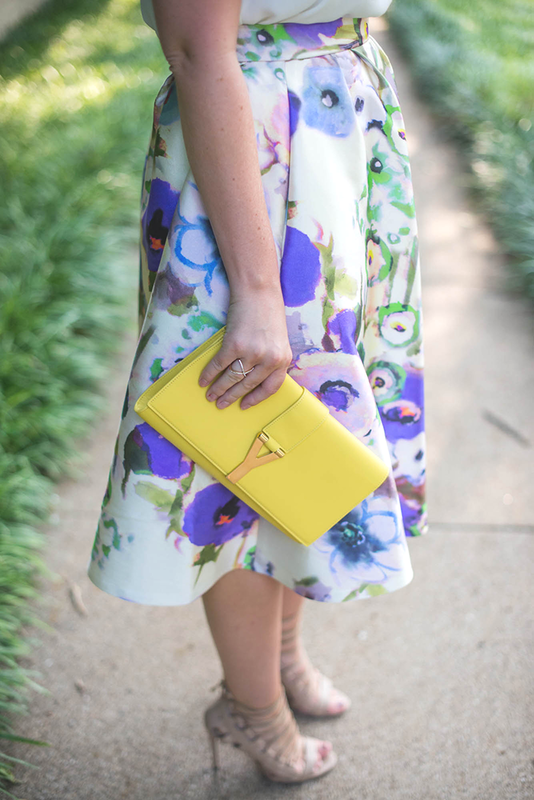 I love how you styled this skirt – so bright and clean! This skirt is absolutely stunning. I Can definitely see why you got so many compliments – it really is such a gorgeous look! wow this is such a beautiful look! It took me a little while to jump on this bandwagon as well, but now I’m loving midi skirts! You look beautiful in this one, love the print! Have a great weekend, Merritt! Midi skirts are my serious go to! You look great in them, nothing wrong with investing in a few! so pretty, I cannot get enough of the midi skirt either! My favorite skirtttt makes an appearance :) I will never tire of seeing it! You look great, love this look. It’s soft, feminine, and romantic. Love you in a midi! Such a pretty soft floral look!! GORG for a summer wedding! That skirt looks sooo good on you! Love that skirt! And I love your hair like that. What a beauty! Oh what a beautiful skirt!!! Love the flowers!! Gorgeous, feminine look! Swooning over those Aquazurra sandals, too. How do they run size wise?